One of the very few buildings to survive the carnage of Passchendaele in 1917 has been requisitioned by a UK theatre company. It will host the revival of a First World War classic written by a playwright who fought at the battle. Director Sally Woodcock set up Mesh last year to produce plays in historic war zones, and its first project is to stage Journey’s End by RC Sherriff at the site of one of the conflict’s most infamous battles a century on. Woodcock called in to the tourist office in the town of Ypres in west Belgium and asked if there was anywhere locally where she could put on a play. “They showed me three or four possible venues but it wasn’t until we came to Het Kruitmagazijn [ammunitions hut] in a field outside the town that I felt we’d found what we were looking for. 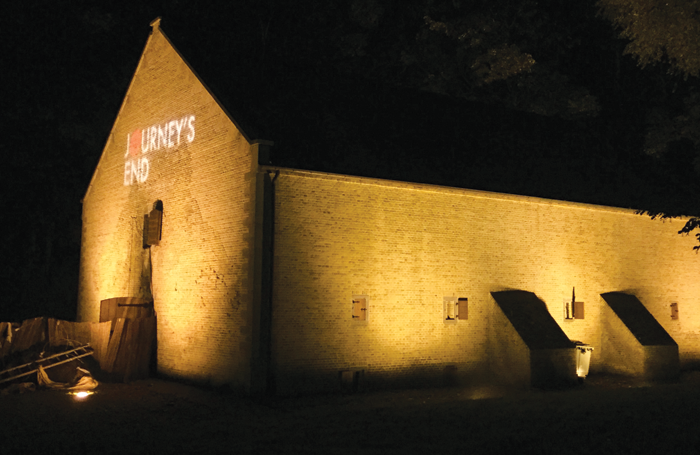 The council has allowed Mesh to use the Kruitmagazijn for free, as its production of Journey’s End – the company will return to the venue this time next year – will undoubtedly appeal to the many thousands of visitors to the battlefields of Ypres, not to mention schoolchildren studying the text of Sherriff’s time-honoured play as part of the English Literature syllabus. 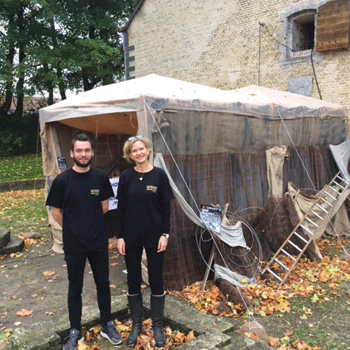 Working on a site-specific project in the UK presents all kinds of logistical and administrative challenges, but the added complication of the Belgian location meant it has taken eight or nine months to prepare for the five-week run in Ypres. In terms of the concept, Woodcock and her 27-year-old designer wanted to create the illusion of entering a First World War bunker through the outer trenches. “It will not be like an ordinary theatre,” says Peacock. “It will be an immersive experience as soon as you enter the building. We have fashioned a tunnel outside the venue that is dressed up to look like a trench, with sandbags, timber supports and signs pointing to the front line,” he explains. Most of the artefacts and memorabilia are on hire from Khaki Devil, the go-to supplier for all things military, based in Bury St Edmunds, Suffolk. Because Sherriff’s play is in constant demand, Khaki Devil does what amounts to a Journey’s End package in which you can pick and choose from hundreds of items from the Great War. 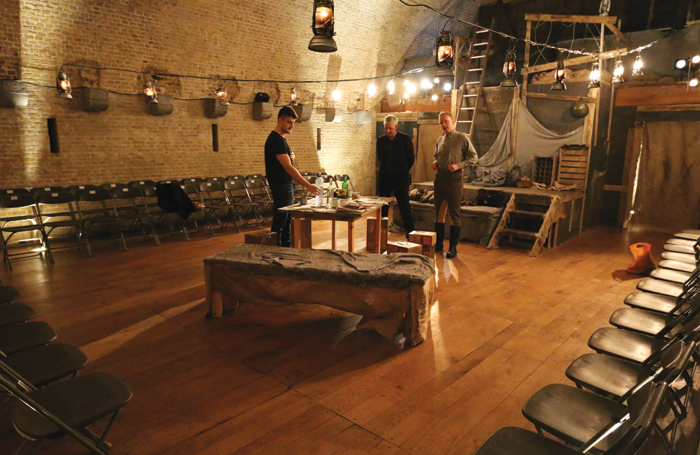 Having worked with Punchdrunk and other immersive theatre companies, Peacock was well placed to look at all aspects of the production design, including sound and lighting. “I did a lot of research into how they built trenches and dugouts, and all the paraphernalia involved with that – the furniture, the artefacts,” he says. They managed to get hold of gramophones and even a printing press to run off the Wipers Times. To help the production, the Kruitmagazijn has a balcony, accessed from the stage by a ladder, which is how the characters go over the top into battle. The designer uses a pre-show soundscape to tell the story of the progression of the war, first with the foot soldiers and cavalry, moving towards the mechanised warfare of tanks and aircraft. Peacock says he and the director wanted moments during the play when the cast had to shout over the sounds of war in the background. “Having the actors trying to get across their lines on top of falling shells and machine gun fire, just as they would have done in real life, made it all seem more authentic,” he says. The complications and demands of Peacock’s role in this project are all the more remarkable for the fact that he only became a designer 18 months ago by accident. That Journey’s End UK tour was seen by Woodcock, who asked Peacock if he would be interested in working with her on the Mesh revival. “The fact that Tim had experience of immersive theatre, especially Punchdrunk, was a huge factor because I always wanted ours to be immersive,” says Woodcock. 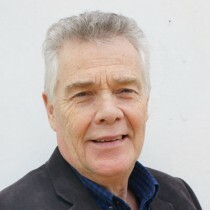 Prior to setting up Mesh with two producer friends, Ben Darmanin and Toby Guy Parsons, Woodcock ran the Cambridge-based Horseshoe Theatre Company, specialising in producing plays on the GCSE and A-level curriculums, and running schools workshops. 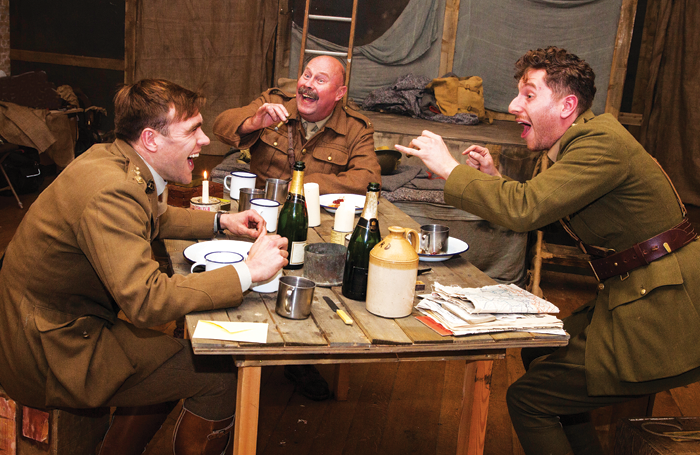 Her production of Journey’s End has attracted a lot of interest from schools and colleges. Also interested are institutions from the Imperial War Museum, the Western Front Association and the British Legion to the Passchendaele Museum and the Flanders Fields Museum, which is five minutes’ walk from the venue. Journey’s End follows a group of Tommies in a dugout shortly before an attack. When the play had its London premiere in 1928, starring Laurence Olivier, it was a surprise success. 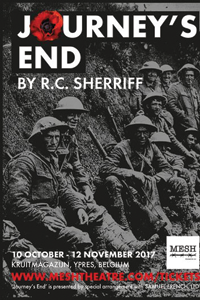 Sherriff said of his great work that he didn’t need to create the characters: “They just walked out fully formed on to the page.” A century on and Mesh is bringing those characters to the site where Sherriff himself fought and was wounded, and where half a million men died over five months of offensives in 1917; a region, echoing the theatre company’s tagline, “where history speaks”.